Home Uncategorized Fairy Fair Poster 2019 is Here! The Fairy Fair Poster for 2019 is now out! Please share it as much as you can. It’s by our lovely designer Samantha Symonds and we think it’s great. 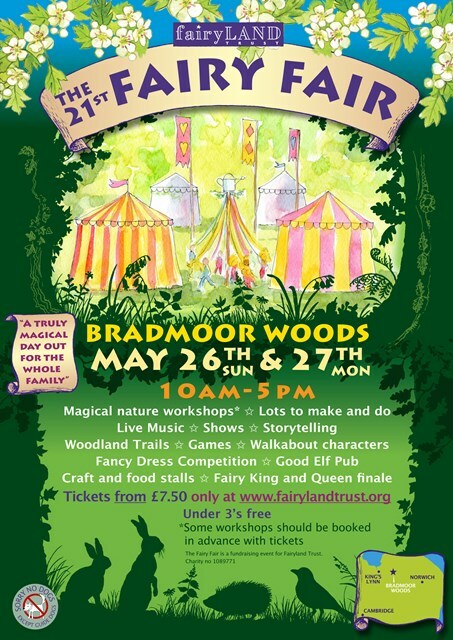 We hope you like it too – if so, please show it to others and encourage them to come to the Fairy Fair at the end of May. First, if you know a shop, cafe, community or children’s centre, nursery, workplace, college or other venue which might take an A4 or A5 version of this poster, please let us know. Best of all, if you can make an introduction for us they are much more likely to say ‘yes’ to someone they know who has a local connection. We’re organizing for someone to take posters around Cambridge in the week starting May 2nd. Second, if you or someone you know would like to volunteer to take some more posters around your own bit of Cambridge that would be a fantastic. We can send you some to go up in our Poster Week starting May 2nd. Do get in touch. Finally – do buy your tickets for the Fair now, before Tier 1 (cheaper) tickets sell out! PS – if you took part in the poster poll a while back you may recognize elements of the winning designs in this poster. We did take notice of what you said! You can see the past posters at the end of our photo gallery here.